You are currently browsing the tag archive for the ‘acdification’ tag. 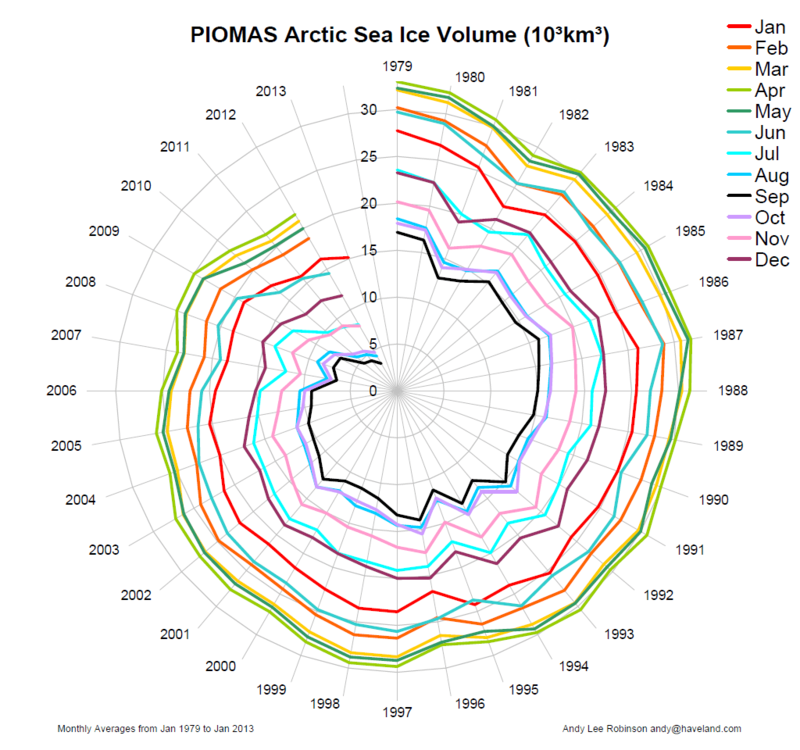 A very telling controversy just erupted over a quiet “emergency” meeting held at the White House to discuss the serious possibility of an ice-free Arctic within the next two summers, what’s now being called the “Arctic Death Spiral” (see graphic). It’s seen almost no mention in the American press, but has been covered by The Guardian and Australian, as well as many smaller news sources. Some are downplaying it, and others are obviously exaggerating. The disputes, though, relate mostly to who was there and how much of an “emergency” it was considered. What isn’t in dispute (and was already known late last year) is the situation in the Arctic. Last year saw a record melt and this year has already seen ice covering the Beaufort Sea shatter like a sheet of glass over a few weeks in February and March. Every summer much of the Arctic ice melts, but over the last few decades total summer coverage has been shrinking dramatically. At current rates, this trend could hit zero as soon as 2015. Let that sink in. “Melting the polar ice caps” has long been touted as one of the worst possible outcomes of climate change, with the potential to sink coastlines or disrupt global weather patterns. As recently as a few years ago, the “worst case scenarios” warned that it could be coming as soon as 2100, or at worst, 2050. Now it’s starting to happen before our eyes. This comes along with word that our atmosphere is due to reach a global average of 400ppm of carbon dioxide sometime this week. Admittedly, this doesn’t really mean any more “doom” than 399 or 401, but it’s a frightening milestone nonetheless – this is likely the highest concentrations have been since the Pliocene era, 3-5 million years ago. The best estimates so far suggest that 450ppm is the upper level if we want to prevent “catastrophic warming”, but as the above paragraphs illustrate, those estimates may have been somewhat conservative. In Ottawa, our own leaders generally spend their time cutting climate-related research budgets and making ignorant statements. Leading the charge is Natural Resources Minister Joe Oliver, who’s most recently taken on Al Gore and NASA’s James Hansen over their criticisms of the Tar Sands. Before that he was forced to clarify that he did, in fact, think climate change was “important” after telling reporters that “people aren’t as worried as they were before“. Perhaps the most worrying of these embarrassing statements are those where he talks about the need to get in on massive demand growth for oil in the developing world, for which he cites the IEA. Unfortunately for him, what the IEA actually said was a little more complicated. It forecast a couple of scenarios for global oil development over the next few decades then worked out how much carbon each would put into the atmosphere. The scenario that Oliver cites is the one in which we take no serious action and approve all projects, ending with a “94% chance” of catastrophic warming. This IEA research, which has been public since late 2011, gives another near-future deadline: 2017. If we don’t turn away from building new high-carbon infrastructure (power plants, industry, buildings etc) by then, we’ll be “locked in” to a course toward at least 450ppm. By the end of their expected operational lifespan, they will have burned enough fuel to cross that line. This, as the IEA says, will “close the door” on warming of less than 2 degrees Celsius. There is more than enough carbon in the Tar Sands alone to put us over that level, as I’ve shown before, and as scientists like James Hansen have been trying to point out. Even without them, though, the world could still easily cross the line. An even larger stock of carbon, equal to about five times everything we’ve burned since the beginning of the industrial revolution, lie frozen in the (quickly melting) Arctic. Hydrates of methane form when gas bubbles get frozen into a lattice of ice crystals, creating ice you can light with a match. As temperatures rise, ice melts and the methane bubbles to the surface and escapes into the atmosphere, where it traps heat (an estimated) 20-25 times as effectively as CO2. This represents one of the “tipping points” we so often hear about where even a slight warming can set off a chain reaction causing far more. Recent readings found the highest methane readings ever recorded in the Arctic, which closely correlated with regions of melting ice. Not content to wait for such a disaster, states and corporations are now testing these methane hydrates as a potential source of energy. One such venture, sent from Japan, just succeeded in extracting natural gas from one of their own deposits under a kilometre of ocean. Other countries, like America, aren’t far behind and though Canada has now dropped out of the race, we developed a lot of the initial technologies on our own Tundra. Another big report is being circulated this week, pointing to another emerging threat in the Arctic – acidification. As the carbon dioxide content of our atmosphere increases, so does the amount absorbed by the sea, especially in cold polar waters. Since the ocean absorbs CO2 as carbonic acid, it shifts the overall PH level, making the water more acidic. The study found “widespread and rapid acidification” which threatens disastrous implications for marine life, especially anything with a shell. Worldwide, the report states, the surface acidity of the oceans has increased about 30% since the industrial revolution began. Particularly vulnerable are tiny life forms like phytoplankton, which make up the base of the marine food chain. Phytoplankton, by the way, is crucial because it can photosynthesize like a leaf, making it an important part of regulating the world’s CO2 levels and the source of at least half the world’s oxygen. In spite of all this evidence and more, new-generation petrochemical projects like the Tar Sands are still considered urgent government priorities. As the timeline for taking meaningful action shortens from decades to years, our leaders aren’t just dragging their heels, they’ve broken into a run in the opposite direction. Not only are carbon emissions still rising, but they’re picking up speed Another international summit, this time in Bonn, Switzerland, just concluded with slight progress, but yet again hit the familiar stumbling block of mutual US-Chinese reluctance to act first. As the date for a “conclusive” treaty gets pushed back to 2020, it’s hard to expect much. Our government has already virtually committed itself to missing our targets, so why should anybody else bother? This cognitive dissonance can’t last forever. Each year that we put off taking serious action and instead pursue more growth in emissions is going to make the eventual transition that much more painful. We’re not just continuing our fossil fuel addiction – we’re deepening it. By developing new kinds of “unconventional” petrochemical extraction, we’re literally re-inventing it. The massive investments now flowing into (very capital-intensive) fracking, tar sands and soon methane hydrate exploitation represent time, land and creativity that isn’t being put toward the “renewables” they celebrate so often. This is creating another kind of “death spiral”, one in which we’re spending ever-larger amounts of money on continually-diminishing energy returns. As this drains the life from a world economy which got used to $15-30 barrels of oil, desperation sets in and the drive to exploit our remaining reserves takes over. These pressures are only going to get worse as we become even more dependent on dwindling fuel sources, and as the cost of ecological side-effects like hurricanes, floods and crop failures continues to mount. This path leads only to ruin, and the sooner we get off it the safer we’ll be. I live near Barton St and work downtown. I see this logic play out every day. What starts as a totally voluntary indulgence in a magical substance which makes everything go faster soon becomes habit-forming. Not long after that, one can barely move at all without it. For a while, it seems glorious – a world of wealth, luxury and vanity – but soon enough the posh nightclub walls fade away and you find yourself on a mouldy matress in the slums. Before you know it, you’re heating rocks with a gas flame then sucking hard on a pipe. Sound familiar? Sometimes, ya just have to quit. Even when it’s hard. Especially when it’s hard. This is why people are turning to direct actions like Monday’s blockade of Highway 6. The world is quickly running out of time and potential “tipping points” are coming into view. Along with this new zeal for “unconventional” oil and gas (tar sands, fracking, etc) comes a whole host of new risks, and the global export network now threatens to spread them across continents. The profits, so far, have proved large enough to sway governments to their side. This kind of reckless disregard for the future of life on earth should give some indication of the “fitness to govern” of everybody involved in these decisions. The appropriate time to begin “reforms” was yesterday. What we do today may need to be a little more dramatic. Building a new world from the bones of the old one. “This is not a normal travelling theatre company you know!” Scotland Yard.